We have created a development kit that allows people to easily learn how to create M2Msolutions. 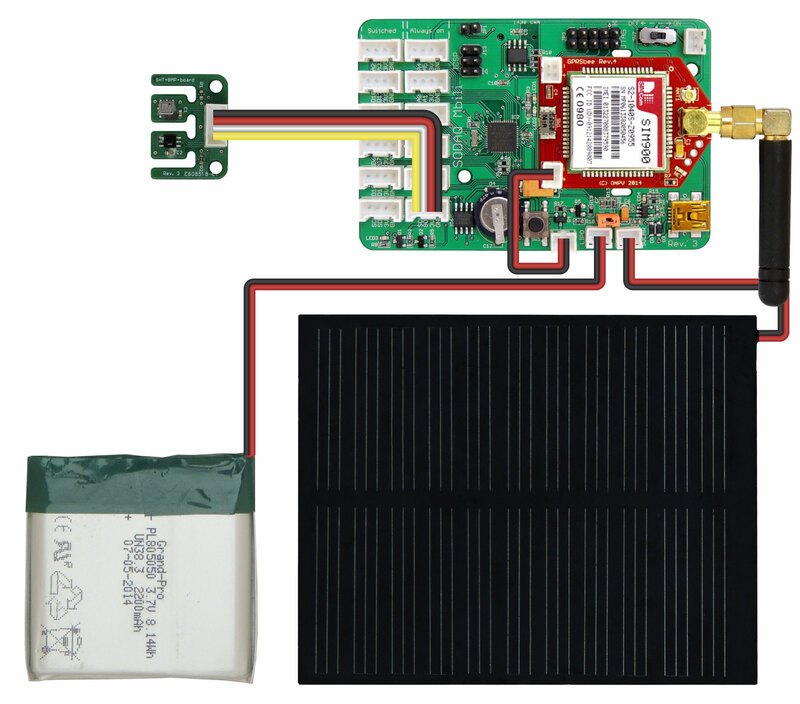 UsingВ this hardware and the demo applicationВ that you downloaded with the SODAQ Mbili files (seeВ Section 2 of the Getting StartedВ guide), В you can have an autonomous data acquisition system set up in just minutes! All you need to do is add a SIM card toВ the GPRSbee (with a data bundle or M2M subscription). Then turn on the SODAQ Mbili board, compile and upload theВ tph_demo from the Arduino IDE to the SODAQ Mbili board. Leave the USB cable plugged in and open the Serial Monitor (Ctrl-Shift-M) and ensure that it is set to the 9600 baud rate. When you are done type ‘OK’ and press enter and the system will start sampling data. Note: The example sketch does not handleВ backspaces yet, so make sure you type it correctly. For a certain initial duration (l=600)В the system will sample the sensor more frequently (as=5) and uploads the data to the server more frequently as well (us=60).В After theВ time (l=600) has been reached, the system starts using a less frequent sample rate (al=300)В and upload interval (ul=3600). The rtc setting (rtc=86400)В specifies how often the real time clock is synced with the time server. It also does an initial synchronisation shortly after start up. You can also configure theВ station’s name (nm), APN (access point name) (apn) of your mobile operator, ftp server name (srv), username (user), and password (pw).В For many operators the APN (apn) name is “internet”, but it could be something specific like “public4.m2minternet.com”.В Make sure you specify an FTP server (srv) to which you have access and a valid username (user) and password (pw) for that server.